We are a top choice for Southampton Airport Transfers both drop off and collect. You can rest assured that your collection from the airport will be fast and efficient, as we constantly track the arrivals board to ensure that in the event of delays, we will be able to collect you in a timely manner to ensure your taxi airport transfer goes as smoothly as possible. The price we quote the customer will be inclusive of entry to the car park at Southampton airport, unless a meet & greet service is specifically required. We offer a meet & greet service for only £5.00 extra which includes up to 1 hour wait in the terminal with the customers name on a board. Our drivers make sure that the customer is contacted on arrival at the airport to ensure the collection goes as smoothly as possible. All of our vehicles are large enough to take plenty of luggage with our Airport Transfers. Please just specify the number of people, and roughly how many suitcases and we will take care of the rest. 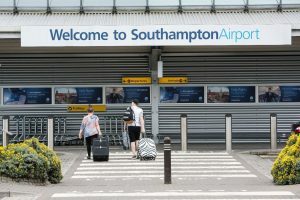 As we are based only 5 minutes from the Southampton Airport, it ensures we offer a very efficient airport taxi transfer service from start to finish. Contact us today to discuss your Airport Transfers.